Last Sunday's Sylvania 300 NASCAR Sprint Cup event at New Hampshire International Speedway had all the fireworks needed in a first race of ten in the 2010 NASCAR Chase for the Cup. 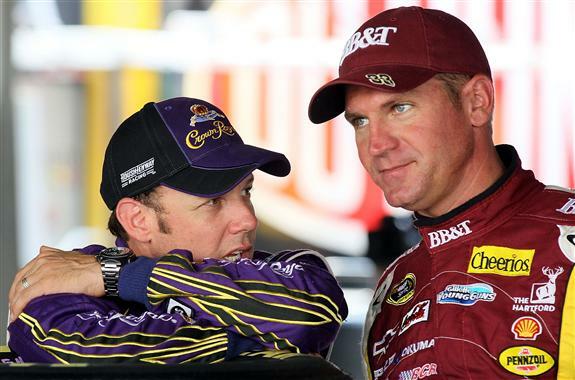 Tension on track, a meltdown by some Chase contenders and the rise of other Chase drivers. Through a fuel mileage gamble, Clint Bowyer and the #33 Richard Childress Racing team were on top of the world as they collectively propelled their team's Chevrolet to victory. However, three days after the celebration for the team which which fought to hold on to the final 12th place spot to make the Chase, the #33 team received news Wednesday afternoon from NASCAR reversing the organization's pride after Loudon, New Hampshire. Dating back to post-race inspection at the previous race of Richmond, NASCAR measured an area of the #33 Chevrolet being out of the allotted tolererances. Penalized in relations to rule violations relating to non-conforming race equipment and for having an area of the race car exceeding maximum measurement. Docking 150 points from driver Clint Bowyer as well as the #33 team, the punishment had a further-reaching impact on their Richard Childress Racing team suspending crew chief Shane Wilson and car chief Chad Haney for 6 Sprint Cup race events. Wilson is also on the hook for a monetary fine of $150,000 penalty as responsible for the #33 Chevy. As a final dishonour, the winning #33 Chevrolet has been confiscated by NASCAR for further study as their R&D facility. Sounding like a harsh sentence handed down by the stock car racing sanctioning body, this penalty is consistent with a similar 150-point punishment levied against the #1 car of then-DEI on a roof height infraction after the July Daytona event in 2008. Reacting to the news through the team's official website, team owner Richard Childress admirably shared embarrassment for the NASCAR decision. “First of all, I’d like to apologize to our sponsors, our fans and everyone at RCR for the situation that has resulted from this ruling. RCR has a long-standing reputation of integrity on and off the race track. We pride ourselves on working within the rules established by the sanctioning body." Childress went on to state that the rule infraction regarded a measurement 6/100th (.060) of an inch off NASCAR baseline. Equating to just 0.0025 inches outside of the rules, the car owner disputes that the #33 car out of spec measurement (which resided just outside of the 1/16 inch tolerances) was the result of damage on the track. With points deducted from the reset Chase points standings, it does seem interesting why NASCAR had announced the rule violation after more than a week and a half following the Richmond event. Sealing his valuable Chase spot by only 98 points ahead of Ryan Newman, if points were deducted prior to the New Hampshire event the #33 Chevrolet would have been logically dropped from the 2010 NASCAR Chase for the Sprint Cup in favour of the #39 team piloted by Newman. Regarding Chase qualification like a win (which NASCAR never considers taking away from a driver and team even when rule violations aree found) NASCAR's Robin Pemberton states "For now we'll leave the winners as they come off the racetrack, and we will fine people accordingly as we do throughout the year."